The Geoweb® system is a cellular confinement system used for soil stabilization, ground stabilization and to create load support for roadways and drilling pads on soft soils. The Geoweb® Load Support Geocell System is a three dimensional cellular confinement system used to confine fill materials to create roadway and pavement systems with minimal granular quantity requirements. The Geoweb® systems are particularly effective in creating load bearing structures over soft or unstable subgrades. Geoweb® systems consists of polyethylene strips welded together to create a cellular confinement structure with various cell dimensions and depths. The Geoweb® systems may utilize lower cost granular material like sand and pitrun gravel for the infill and through confinement dramatically increases these material's ability to carry loads. The Geoweb® systems include the latest improvements to cellular confinement technology including textured surfaces for increased friction, perforations for lateral drainage and ATRA® Keys for panel-to-panel connection. Polypropylene geogrids are used for high strength applications where biaxial strength is required. Geogrids are used for high strength applications such as retaining walls and embankment reinforcement. Flexible fabric concrete forms allow the designer to place a layer of protective concrete in almost any position. RSi geotextiles have high tensile modulus and water flow properties making them more efficient for reinforcement of roads. High strength woven geotextiles are used for high strength soil reinforcement applications. Geogrids are used for high strength applications such as retaining wall and embankment reinforcement. 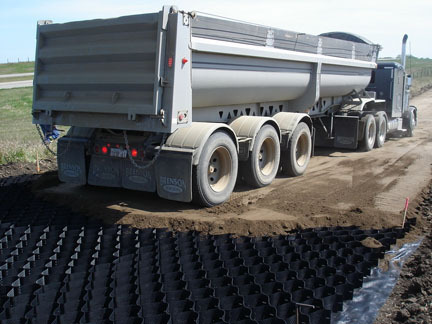 Biaxial polypropylene geogrids are used in base reinforcement applications such as roads, storage yards and parking lots.